High-Quality Craftsmanship, Affordable Chicago Siding Company - What’s Not to Love? Your property exterior is the first impression that you give of your home. A beautiful exterior creates a warm, welcoming, and highly appealing property. This is something that siding is well-known for achieving. Available in a vast range of colors, styles, and textures, modern siding delivers a wow factor that can truly elevate a properly. However, siding that has been exposed to the weather for too long without repair, that has been damaged, or that is starting to flake and peal, delivers the opposite. Worn siding can leave even the most stunning of homes feeling drab and unloved. A property with exterior wall cladding that has seen better days, is often more of a burden than a finish that can deliver the wow factor. Having to repaint, stain, and scrape down the sidings on your property, can feel like a never-ending task. Needing to put such extensive effort into maintaining that beautiful look, at the first sign of bad weather, can be enough to put you off siding once and for all – despite the unique appeal it can give to your home. Thankfully, there is an answer to sidings that are not living up to their potential. Through siding repair and replacement, you can revitalize the look of your home, and give it back that easy to care for curb appeal that it once had. Whether you need siding repairs or a full siding replacement, the time to act is now! If your siding feels more like a nightmare than a dream, Apex Exteriors are here to help. Many homeowners aren’t aware of the wide selection of sidings available for use in their homes. From complete siding tear-offs to covering an existing one, Apex Exteriors will make sure you have get the best siding service possible. As the most reliable replacement siding installation contractor, we will help you choose the perfect siding style, color, and texture for your home. We can also replace your soffit and fascia with high quality aluminum siding to boost your home’s curb appeal. Let our team of professional siding installers know what you need, and we’ll do the rest. Siding Repairs - Protect Your Home! Worried that your siding is not performing as it should, or noticed visible signs of wear and tear on your siding? It sounds like the perfect time to get that siding repaired! Repairing the sidings on a property is a task that many people put off, not realizing just what their missing out on by leaving their sidings in poor condition. Not only is the damage to the sidings absorbing the potential of your home’s curb-side appeal, but it could also be hiding must worse damage to the structure of your home. The main purpose of siding is two-fold; to improve the look and finish or your home, and to better protect your exterior walls from weather damage. The sun, weather, and temperature damage that have caused issues to appear with your siding, can just as easily cause damage to your walls. If your siding is no longer well-equipped to combat these potential property-destroyers, then the walls of your home are going to be left to take the brunt of the damage. Enjoy Lowered Maintenance – The first benefit, lowered maintenance, is the reason why so many people seek to get their siding repaired in the first place. Damaged siding can be an absolute nightmare to maintain. As the effects of the weather begin to stack up, that once beautiful siding starts to discolor, and the stunning finish begins to flake away; what’s left, is a constant chore. With brand-new siding, you start fresh with a high-quality product that can fight back against the elements. No longer will bad weather mean yet another coat of paint is needed after hours spent scraping away flaked paint. Repaired siding offers the convenience of low maintenance care. Enhance Your Curb Appeal – Everyone wants their home to look great, for their own benefit and to deliver the best first impressions possible. It’s no secret that damaged siding is not an attractive finish on a property and is unlikely to be what you want your home to look like. The difference that repaired or replaced siding can make is truly impressive, able to completely transform the appearance of any style of property. While siding may be an essential defense against weather-damage, it also provides one of the most eye-catching property finishes. Add Value to Your Property – You can’t talk about curb appeal without looking at property value. The exterior of your home is incredibly important when it comes to attracting buyers, but then also retaining them. When you’re trying to sell your property, there are few better places to start with a make-over than the outside of your home. Every buyer wants to feel wowed by a property, and that’s certainly something that siding can deliver when it is in good condition. Upgrade the Energy Efficiency of Your Home – For the comfort of the interior of your home, and your property’s energy efficiency rating, the condition of your siding is of the upmost importance. The siding creates an additional barrier on the exterior of your property, helping to keep your home warmer by providing extra insulation. By choosing insulated siding to replace your existing siding, you can help to reduce the energy that you expend when heating your property. Removing existing siding is also the perfect time to have additional insulation installed in your property. Improve Structural Security – Siding can hide many property defects, which can be both a good thing and a bad thing. Siding that has been attached to the exterior of a property for many years, may be hiding serious structural problems. This could especially be the case if the siding has been damaged or worn away and has been unable to protect the walls as it should. Repairing your siding is not only a great way to improve the look of your home, but also assess any damage underneath and get important repairs done. If you’re siding has gone past the point where a simple repair job is not enough, or you feel like a complete change from your current siding style, then a siding replacement may be your best bet for a full property revitalization. Even if you’re used to a different form of wall cladding, siding may just be the trick to take your property to the next level. Internally framed walls constructed from steel l-beams or wood, have a requirement to be sided, but with masonry walls, the choice is yours whether you want to transform your home with modern siding or not. If you’re new to siding, or after something completely different, then you have plenty of styles and designs to choose from! Traditional home or modern property, siding can accomplish any look that you’re after. Siding replacement gives you the opportunity to breathe some fresh air into your property and truly modernize the look and feel. There are a vast range of materials, styles, colors, and textures to choose from, all of which can create a completely unique finish for your home – not to mention improve the performance of your property with additional protection and insulation. What Siding Types Are Available? Siding has come a long way in recent years. Today, homeowners have near endless combinations to choose from when looking to replace their siding in Chicagoland. You have some big decisions to make when removing and replacing your siding. To get the perfect finish for your home, style, texture, and color, are incredibly important. The material that you choose for your replacement siding will really set the tone for how the finish will look. Each material available for siding has a different selection of unique properties, and of course, an entirely different aesthetic appearance. When selecting a material, quality is of the upmost importance. The siding is going to be your property’s first line of the defense against the harshest of Chicago weather, so it needs to be able to perform exceptionally when the time comes. Cement Boarding – A strong and highly durable option, cement boarding comes in multiple different finishes to mimic the look of traditional siding, such as wooden clapboards and shingles. The siding is easy to maintain and is highly resistant against the elements, fire, rot, and termites. 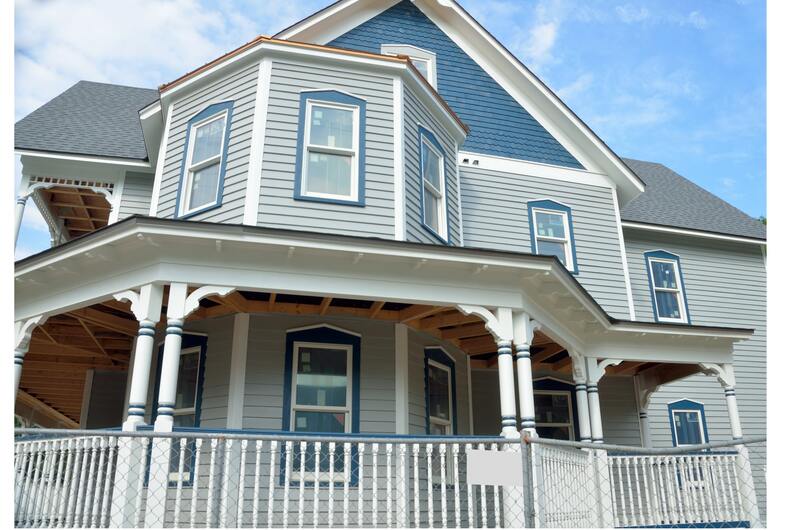 Aluminum – A prime choice for properties on the coast that are exposed to salt air, aluminum siding offers a modern finish with a highly durable material. The siding can easily be shaped and is very lightweight, as well as being able to provide a truly unique finish to any style of property. Natural Cedar – Beautifully traditional and ideal for classic or contemporary properties, natural cedar siding is a firm favorite. The wooden cladding is highly customizable, with multiple colors available to paint or stain the wood. Cedar is well-suited as a siding material, and a common choice for a traditional look. Wood Shakes – For a highly classic finish, wooden shakes open the door to a whole new range of possibilities with designing. The small shingles deliver a rustic charm and are capable of accentuating intricate styles in all manner of property types. 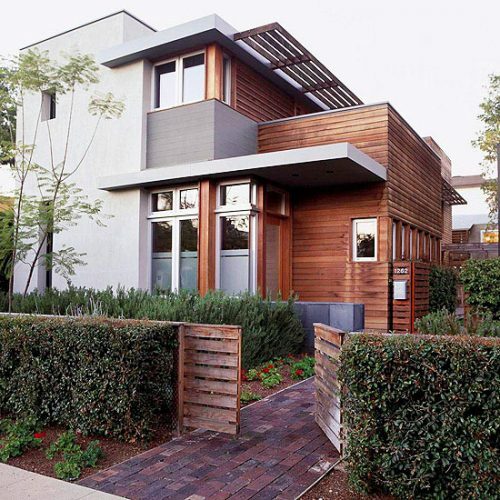 Made from resistant cedar, wood shakes are an ideal way to protect the exterior of your home. Vinyl Cedar – Vinyl siding is perfectly crafted to offer a wealth of style, design, and color choices. The easy to maintain material mimics the look of traditional cedar siding but offers a much more durable finish that can be easily customized to fit new and old styles of property. For a very low maintenance material, vinyl is a superb choice that is built to last. Insulated Siding – The option of custom-fit insulated siding gives you the opportunity to get even more out of your high-quality wall cladding. Insulated siding is one of the most advanced forms of siding, providing additional home insulation without having to compromise on style or appearance. From the vast range of colors to the unique textures and advanced constructions, many people are shocked by just what an extensive range of siding materials are available in Chicago, IL. Selecting the right style for your property involves getting the perfect balance between a product that is going to last and protect your home, and one that is going to make your property really come alive. There are so many directions that you can go in with siding to completely change the appearance of your home. Whether you want your existing siding completely removed and replaced, your current siding covered over, or even your fascia and soffit replaced with beautiful aluminum siding, the options are near endless when it comes to revitalizing your home with replacement siding. Suffering any damage to your home can be a worrying time, especially when it changes the appearance of your home so drastically. Thankfully, siding can be replaced and repaired, bringing your home back to its previous condition. By working very closely with insurance companies, we make sure that you never have to wait longer than what is needed to get your siding repaired. At Apex Exteriors in Illinois, whether you want your siding repaired or replaced, we work with you to find a solution that is going to be of most benefit to you and your home. Our expert team can help you to put together the perfect design to really enhance the appeal of your property, or you can tell us exactly what you want, and we’ll help you to realize your dream. Our extensive range of siding options, ranging from high-quality materials to a stunning variety of textures and colors, puts control in your hands. This gives you the ability to not just settle on siding that ‘looks ok’ but select a finish that looks truly breath-taking. Homeowners in Chicagoland have the fantastic choice of siding from Mastic, CertainTeed, and many other outstanding, high-quality options, at Apex Exteriors your trusted local area of Chicago siding company. When you choose Apex Exteriors, you are choosing a professional service that specializes in beautiful finishes and the highest quality of products. Need damaged siding repaired? After the perfect replacement siding? Give Apex Exteriors a call today. We also offer a variety of other siding options. Homeowners can choose from Mastic Home Exteriors and LP Smartside Siding among others. So, don’t wait another minute! Let our highly-trained consultants help you find the best siding repair service and replacement solutions for your property. Call Apex Exteriors, Inc. today for a free estimate!